China to accelerate thorium reactor development. 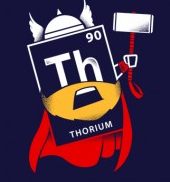 Thorium is a viable alternative to uranium for power generation with some huge potential advantages. It is a shame that the United States is not aggressively pursuing it as an energy source. China has been exploring the use of thorium and just announced a rapid acceleration in their development schedule. A team of scientists in Shanghai had originally been given 25 years to try to develop the world’s first nuclear plant using the radioactive element thorium as fuel rather than uranium, but they have now been told they have 10. But the Chinese are working toward the holy grail of thorium reactors: a Liquid Fluoride Thorium Reactor (LFTR or “lifter”). Here is a nice “TED.com” video on the LFTR concept. China’s appetite for energy is growing by leaps and bounds. Coal is their primary source of electricity, but the resulting smog chokes their cities. Coal will continue to be heavily utilized in China in coming years, but they see thorium a likely route to a cleaner future. They currently have nearly thirty nuclear reactors of various types under construction to meet some of the growing demand. But the LFTR has the greatest potential for fuel supply, non-proliferation, and minimal long term radioactive risk. It is sad that the great United States may have to learn this lesson from the Chinese. Here is a video that has already been seen by over 300,000 times. It is well worth your while if you have not alreardy seen it. It is two hours of shoestring production, but rich in content. Kirk Sorensen is an aerospace engineer with a passion for promoting Thorium energy. Not just any Thorium energy, but specifically Liquid Floride Thorium Reactors (LFTR – pronounced “lifter”). You can see much more at EnergyFromThorium.com. Kids in the US spend about 12,000 hours sitting in classrooms by the time they graduate from high school. Vast amounts of that time are wasted on nonsense and trivialities. If 0.2% of that time were spent on getting them to understand the content of this video, it would change the world.